The Oxford University Professor Daniel Came wrote to the agnostic Richard Dawkins:: "The absence of a debate with the foremost apologist for Christian theism is a glaring omission on your CV and is of course apt to be interpreted as cowardice on your part." Below are some notable debates related to agnosticism or which an agnostic participated in. Despite there being more self-described agnostics in the world than self-described atheists (See also: Definitions of Atheist and Agnostic), since at least the latter part of the 20th century, there have been more atheism vs. Christianity debates than atheism vs. agnosticism debates (see: Atheism debates and Atheism vs. Christianity debates). In recent times, however, there have been notable cases of atheists being unwilling to engage in debates (see: Atheism and cowardice). Richard Dawkins is an evolutionist and agnostic (see: Richard Dawkins and agnosticism). Below are some debates that Richard Dawkins had with theists. In recent times, there have been some notable cases of Richard Dawkins dodging debate offers (see: Richard Dawkins and debate). The Oxford University Professor Daniel Came (an atheist) wrote to Richard Dawkins: "The absence of a debate with the foremost apologist for Christian theism is a glaring omission on your CV and is of course apt to be interpreted as cowardice on your part." As briefly noted earlier Richard Dawkins had a debate with Rabbi Shmuley Boteach. Rabbi Shmuley Boteach was named the London Times Preacher of the Year 2000 and is the author of 20 books. “ That is a particularly bold untruth. Our debate, which took place at St. Catherine's College, Oxford on Oct. 23, 1996, attracted hundreds of students and featured, on the atheist side, Prof. Dawkins and chemistry Prof. Peter Atkins, and on the religion side, me and Prof. Keith Ward, Oxford's Regius Professor of Divinity. Student president Josh Wine was in the chair," the rabbi explained. "In a vote at the end of the debate as to how many students had changed their minds after hearing the arguments, Dawkin's side was defeated and religion prevailed, which might account for his selective memory," he wrote. A video of the debate that Dawkins lost to Rabbi Shmuley Boteach is available at Rabbi Schely Boteach's website. “ We don't believe a word Richard Dawkins says and for good reason. For example, he claimed to have never debated Rabbi Schmuley Boteach, but then he had to admit a debate took place as it was videotaped. According to the student audience, the rabbi won the debate as he convinced more students of the validity of his position concerning the existence of God. Furthermore, an angry and embarrassed Dawkins then claimed the rabbi shrieked like Adolf Hitler. Now tell me, how do you forget a debate with a rabbi who supposedly shrieks like Adolf Hitler? Obviously, Dawkins exposed himself for the clown and fraud he is. John Lennox pointed out to Richard Dawkins that Dawkins claimed in his book The God Delusion that Jesus may have never existed and that Dawkins errantly claimed that ancient historians have some disagreement on whether Jesus existed or not. After some additional discussion with Dawkins, Dawkins conceded that Jesus existed and said, "I take that back. Jesus existed". Richard Dawkins no longer will debate a creation scientist. Robert Sloan, Director of Paleontology at the University of Minnesota, reluctantly admitted to a Wall Street Journal reporter that the "creationists tend to win" the public debates which focused on the creation vs. evolution controversy. In August 1979, Dr. Henry Morris reported in an Institute for Creation Research letter the following: “By now, practically every leading evolutionary scientist in this country has declined one or more invitations to a scientific debate on creation/evolution.” Morris also said about the creation scientist Duane Gish (who had over 300 formal debates): “At least in our judgment and that of most in the audiences, he always wins.” Generally speaking, leading evolutionists generally no longer debate creation scientists. “ As I have said repeatedly, Richard Dawkins is a huge intellectual fraud, and perhaps those who previously expressed incredulity at the idea that I would quite easily trounce the old charlatan in a debate will find it just a bit more credible now. This behavior isn't an outlier or a momentary lapse of memory, it is entirely characteristic. The man quite frequently pretends to knowledge that he patently does not possess and assumes he knows things that he obviously does not, which is why he avoids debate with those who are aware of his intellectual pretensions and are capable of exposing them. It's bad enough that Dawkins couldn't come up with the name of what he considers to be the most important book ever written immediately after claiming he could do so, but in addition to stumbling a little on the subtitle, he even forgot the rather important part of the title that refers to the actual mechanism supposedly responsible! As noted earlier, it was agreed before the debate that discussion of religion was not to occur during the debate and that only the evidence related to the physical sciences were going to be discussed. 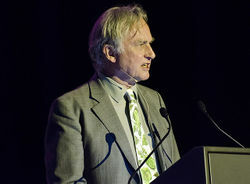 At the end of the debate, Richard Dawkins started to give an impassioned plea to the audience to not give a single vote to the creationists which would show support for creationism. Mr. Dawkins was told to sit down by the President of the Oxford Union for violating the terms of the debate as far as not mentioning religion (as noted earlier John Maynard Smith also violated the terms of the debate). As mentioned earlier, Paul Humber notes there was a deception that occurred during email correspondence with Mr. Dawkins concerning the tally of vote counts that occurred for the Huxley Memorial Debate between creation scientists Professor A.E. Wilder-Smith and Professor Edgar Andrews and evolutionists Richard Dawkins and John Maynard Smith. Mr. Humber did not indicate whether Mr. Dawkins committed the deception or was merely duped by someone who provided an altered account. “ This is the 1948 debate between Jesuit Catholic Priest Frederick Copleston and philosopher Bertrand Russell on the “Existence of God”. A proper transcript can be found in The Collected Papers of Bertrand Russell, volume 11, ed. John G. Slater (London: Routledge, 1997) pp. 524-530, 532, 540-541, as well as The Mystery of Existence, ed. John Leslie and Robert Lawrence Kuhn (Wiley-Blackwell: 2013) pp. 53-55. This is simply a portion of the debate between Copleston and Russell, and captures Copleston’s brief presentation of the Leibnizian Cosmological Argument, drawing upon the principle of sufficient reason as his referent to affirm the existence of God. The historic debate between Bertrand Russell and Father Frederick Copleston features intricate fighting over Hume’s idea that being infinitely old could make a universe unmysterious. Copleston believes in a divine person, God. God possesses necessary existence, he says, because God’s essence and existence are identical. God’s nature actually is “to exist.” However we don’t have “any clear intuition of God’s essence as yet” so we cannot, just by contemplating this extraordinary essence, have our proof that God exists. Instead we deduce God’s necessary existence from the fact that the universe would otherwise have to be “its own cause,” which Copleston views as an absurd idea. Even if successive stages of the universe formed an infinite chain, each link caused by an earlier one, this could not remove the need for God. Without God, there would be nothing to give existence to the chain as a whole. The agnostic Robert G. Ingersoll had a written debate with the theist Judge Jeremiah S. Black. In addition, Ingersoll had a debate with the Rev. Dr. Henry Field. This page was last modified on 8 April 2019, at 23:59.